My Word! recorded at the Queen Elizabeth Hospital, Birmingham. 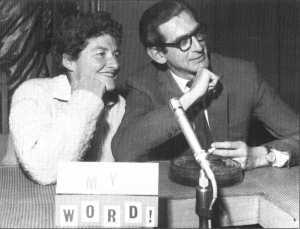 (Left to right): Nancy Spain, Denis Norden, Jack Longland (Chairman), Valerie Hodgetts (Sec. to Tony Shryane, keeping the score), Arnot Robertson and Frank Muir. Performed before an appreciative audience, My Word! had several segments; word origins, word meanings, word themes with teams earning two points for each correct answer. 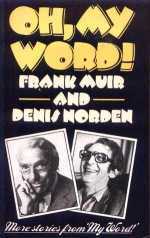 The series was created by Edward J Mason and Tony Shryane and performed by Frank Muir & Denis Norden. Fellow panellists included Dilys Powell, Nancy Spain, E. Arnot Robertson and Anne Scott-James and the compéres were John Arlott, (Sir) Jack Longland, John Julius Norwich and Michael O'Donaugh. (Lady) Antonia Fraser was also in the chair for one series in 1987. The most popular segment was the stories of the confused origins of popular phrases. These are printed complete in the many My Word! books. In the early days the programme was recorded in the Midlands. It moved to London in the 1960s. The programmes were recorded at the Playhouse Theatre (now a conventional theatre again, in Northumberland Avenue near Charing Cross Station), occasionally at the Paris Studio in Lower Regent Street, and at a tiny studio at 201 Piccadilly next door to Simpsons, a now defunct department store. 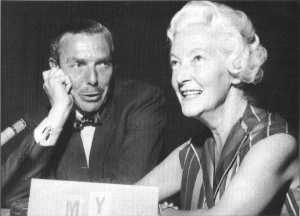 A bit of trivia: Isobel Barnett did the pilot for 'My Word' at the BBC's studio in the Aeolian Hall in Bond Street but when they decided to make a series they refused to part with the cash for petrol for travel from the Midlands because of the Suez Canal crisis, so Arnot Robertson was asked instead! Apart from My Word!, Tony Shryane is co-deviser with Edward J. Mason of the crime-quiz Guilty Party which has been heard on Home and Transcription Services, also produces The Archers and to date has produced over 1,900 episodes; the 2,000th episode will be broadcast on 26 September 1958. My Word! is a word game, played by people whose business is words. It has been described as a cross between a quiz and a literary riot. 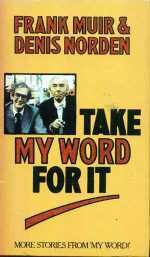 The four permanent team members are E. Arnot Robertson, film critic and writer; Nancy Spain, journalist; and Frank Muir and Denis Norden, scriptwriters of sound radio's Take It From Here and television's Whacko. I find that the mixture of wit and learning is kept well-balanced with these four personalities, ably managed by chairman Jack Longland, Director of Education for Derbyshire. It was in 1956 that I first devised the programme, together with Edward J. Mason who compiles the material, and at the end of this present series thirtyseven programmes will have been heard on the Home and Transcription Services. Now how does one set about organizing a series of My Word! programmes ? In December last, Head of Midland Regional Programmes asked for thirteen editions to be recorded for transmission, beginning in April of this year. Roughly three months before the first broadcast, I started to organize dates for recording. As you can imagine, it is not easy to arrange dates that will suit five such busy people whose careers often take them all over the British Isles and sometimes out of the country. For instance, I may suddenly discover that Nancy Spain will be returning from a trip abroad and transport has to be laid on to rush her from the airport to the studio, with all fingers crossed against possible weather delays. Locations also have to be arranged. During the last eighteen months I have taken the team to many different towns in Midland Region, Oxford, Great Yarmouth, Banbury, Rugby, Wymondham, Leicester, Birmingham, Derby, Lowestoft, Northampton, Ashby de-la-Zouch, Stratford-upon-Avon, Leamington... At all these places we have found a warm welcome by enthusiastic audiences, mainly consisting of the medical profession, as in the majority of cases the locations I have chosen have been hospitals. Dates and locations arranged, the next job is to organize the printing of tickets, followed by the distribution to local V.I.P.s, press, and hospital staff. I always make a point of visiting the location concerned a few weeks before the recording date. A spot of reconnoitring beforehand helps when it comes to organizing five, occasionally temperamental, personalities in a usually tight time schedule. There is no rehearsal for the programme, of course, as it is completely spontaneous, but the team do like to relax with a drink and a sandwich before the show. I am very lucky in Midland Region to have the enthusiastic co-operation of the Mobile Recording Engineers, who with their recording van have travelled hundreds of miles to help make the programme a success. They were very amused when, in Derby, two passers-by were heard to comment on the arrival at such-and-such a hall of the R.S.P.C.A. van! At the end of the recording, which normally lasts approximately three-quarters of an hour, the chairman and team can relax; their contribution is over for another week. Hastily signing autographs as they go, they rush to catch the next train back to London. Back at Birmingham in the editing channel, the programme is cut to size. The recording engineers are often asked to do the impossible in the way of editing but they never fail to do an expert job, and the fact that so few people realize that the programme is edited at all is a great credit to their ability. Before and after editing, my secretary, Valerie Hodgetts, has to check the quotations recorded with Copyright Department who decide whether the quotations can be used, and if so, what payment must be made. She also keeps the score during the programme, and in my office maintains an efficient card index system so that Edward J. Mason can keep a check on words and quotations to prevent their being used twice. He is constantly searching the pages of reference books for words that will provide scope for the hilarious imaginations of Muir and Norden. He is always convinced that he has exhausted the supply, but when pressed for the next script he succeeds in discovering fresh brain-teasers to delight both team and audience. The success of My Word! is undoubtedly due, I believe, to the terrific team spirit shown by all who are involved in the assembly of the programme.